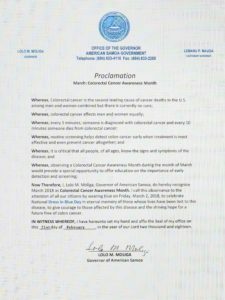 Governor Lolo M. Moliga signs Colorectal Cancer Awareness Proclamation recognizing March 2018 as Colorectal Cancer Awareness Month. He calls to the attention of all our citizens to celebrate National “Dress in Blue Day” by wearing blue on Friday, March 2, 2018. The good news? If everyone age 50 and older were screened regularly, 6 out of 10 deaths from colorectal cancer could be prevented. Communities, health professionals, and families can work together to encourage people to get screened- Prevent Cancer Foundation. Thank you Governor Lolo M. Moliga for supporting the American Samoa Community Cancer Coalition in helping the people of American Samoa fight cancer.